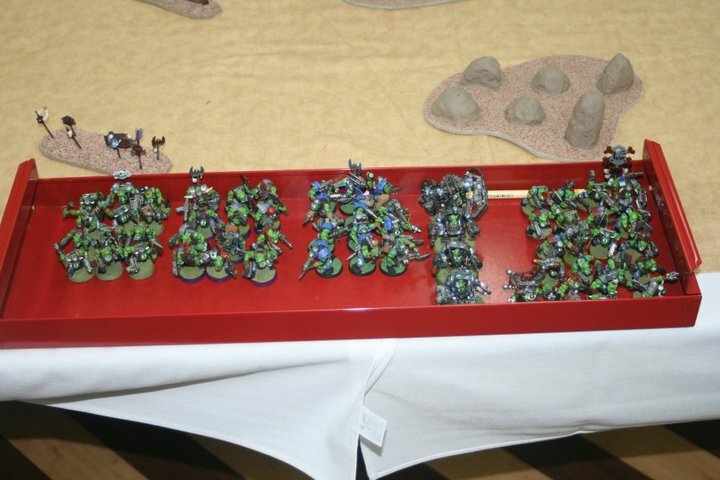 The best Warhammer 40,000 tournament in Canada, possibly even North America came and went this past weekend. I’m not sure the final total of numbers but I believe it was 38 or 40. A lot of locals this year, I think even the first year the locals outnumbered the out-of-towners. Some players from Calgary, some from Kelowna, some from the U.S.A. but I’m sure all had come out for their chance to win an invitation to the North American Grand Tournament Finals in Las Vegas, Nevada to be held in Summer of 2011. No matter the reason why they came, I’m pretty sure everyone had a great time over the weekend playing out 6 unique and individual games; I know I did. What makes Astronomi-con unique is that it’s not an ‘Ard Boyz style tournament where you game your brains off and see who smashes each other more with no rules for composition or sportsmanship. 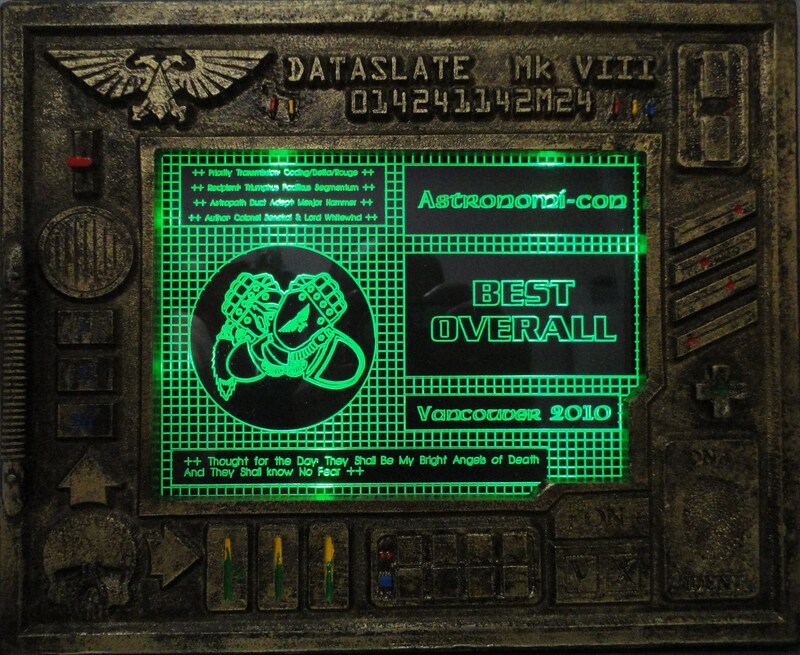 Astronomi-con is a tournament for hobby enthusiasts and the missions are designed to make you think outside the box. 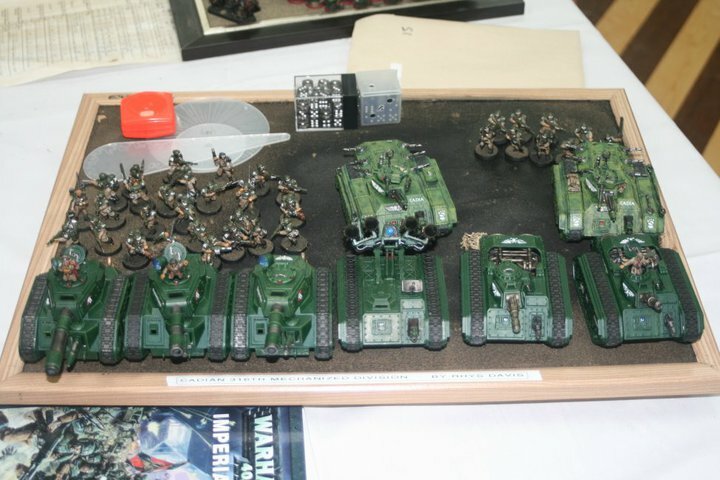 Just like the Astromini-con I went to earlier this year (where I won Best Overall and thus won free entry into Astronomi-con this weekend) players get judged on their creativity on their Army List, their Painting, their Composition, their Sportsmanship and finally their Generalship. Past winners have won because they had it all, and some didn’t even have to win all of their games; their soft scores (painting, composition, sportsmanship) were high enough to take them over the top. My first game was against Mitchell Stevens, a local from North Vancouver who frequents GW Metrotown, and his Imperial Fists. He’s a great painter, but I don’t think he plays a lot of 40k to be honest. The mission was a fun variant on an objectives based theme where there was a convoy of 6 trucks in the center of the table heading from left to right and we had to capture the cargo. Strangely, 5 of the 6 trucks all randomly rolled to move and ended up going towards Mitch’s table, so I proceeded to try and blow them up to destroy the cargo (I got 3 of them lol). Unfortunately Mitch grabbed a cargo and started running away to cover to hide. My Leman Russes had a field day of just blowing up Marines, including 9 of the 10 Tactical unit holding the objective. On the bottom of turn 5 (my turn) my Stormtroopers assaulted the lone Sergeant with the crate and killed him, taking the crate. The game ended on the dice roll of 1, leaving me with the 12-2 victory. My second game was against another local from Vancouver named Andrew “Muskie” McKay, who frequents Strategies Games in Vancouver, and his Chaos Space Marine army. 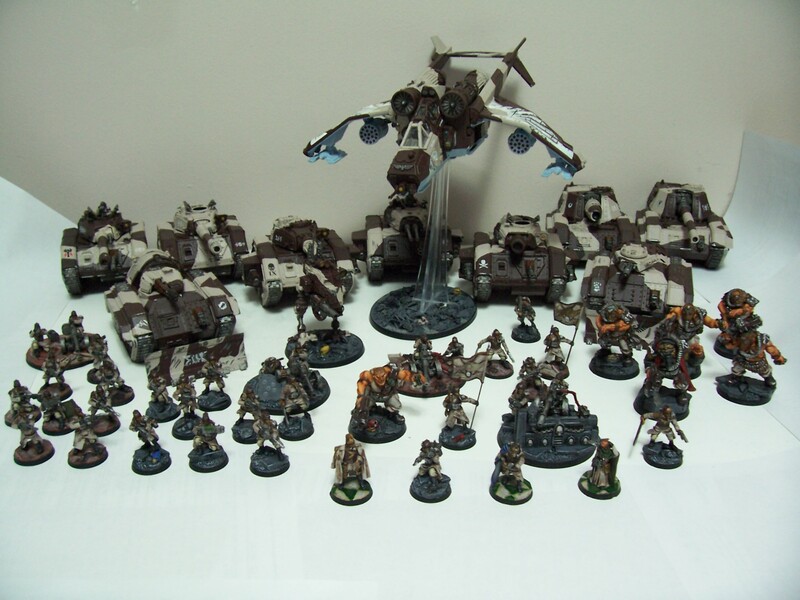 Muskie continuously writes about my army on his blog and keeps stating that he “will finally crush once and for all” but just like at Astromini-con, he didn’t. (Sorry Muskie!) Our mission was just a simple spin on a victory point mission, nothing fancy. The table was mostly city terrain, so a few places to hide and decent cover. Unfortunately for Muskie, my Ogryns stole the show! They charged his Lord & Plague Marine retinue (after softening them up with their Ripper Guns) and managed to kill his Terminator Khorne Lord in one foul swoop! The Sorcerer ran away and then the Greater Daemon charged in and was quickly dispatched by the Ogryns a turn later. In the end, Muskie was tabled for a 12-1 victory. Next year Muskie, next year! My third and last game of day one was against a guy from Vernon, Alex MacDougall, and his Tyranid army. This army was built with one purpose in mind, to win at all costs. It was a hard list, with both the Doom of Malan’tai and Ymgarl Genestealer special characters on top of a Tervigon, Hive Tyrant and Trygon.. not to mention a unit 0f 30 Termigaunts and a unit of 15 Genestealers. The mission was a capture and control 6 objectives, however it was called “Lost in the Mist” where the whole table was effectively empty but any shooting beyond 12″ was successful on 5+ no matter your Ballistic Skill and all Ordinance scattered without reductions… it was my worst nightmare combination of anti-shooting scenario vs a close combat army. I put up a good fight and even held one of the objectives (despite most of my army being destroyed) at the end of the game, but victory in game three at the end of day one, was not mine to claim in a 12-2 loss. My fourth game and first of day two was against another local named Derrick Rioux Maier from Vancouver, who was one of the three guys responsible for running Astromini-con (which we played in that tournament as well which he was the ringer), and his Ork army. The mission we played was called Lost Patrol, where we both picked a unit to start on the opponents side of the table within his deployment zone, and everything else started in reserves. The trick was to get your unit back to your side and keep it alive. Well I picked my Vendetta and then with my free Scout move, turbo boosted it to my side before the game. Unfortunately, he concentrated all of his anti-tank firepower onto it and eventually blew it up. However, because it was a victory point mission, I ended up killing more of his units than he of mine and pulled out a 9-4 victory in the end. My fifth game was against a guy from Kelowna, Rhys Davis, and his Imperial Guard army. Our mission was called “Err Supply,” a play on words where an air supply has gone wrong and we have to randomly scatter 3 objectives onto the table and retrieve them. All three landed within 8″ of the center of the table, to which Rhys made it there first. However, I believe, too confident in his 3 Leman Russes and Manticore, that I was able to concentrate on the objective more than he was. He kept trying to kill my guardsmen in cover all game while my Ogryns advanced up the table, killing something on every round (his and mine) and continuously advancing towards his side of the table. They killed a Devil Dog, his Command HQ, 3 squads of Veterans, 1 Chimera and 3 Leman Russes all in hand to hand. Rhys conceded before turn 5 resulting in a 12-1 victory. My sixth and final game of the exhausting weekend was against Jeff Scalzo and his Necrons. I believe he did mention he was from Calgary. The mission we played was a straight up Victory Point mission but there were these 3 models called “Ambulls” that deep strike onto the table and try and mess up your plans. They weren’t overly difficult to kill, but they can deep strike into hand to hand and take away some shooting right away. Fortunately that didn’t happen to me, and all 3 of them attacked my opponent. He had 3 squads of 3 Wraiths plus a Destroyer Lord with a Resurrection Orb that turbo boosted across the table after stealing the initiative from me. I didn’t do much to the Wraiths in the shooting phase, but did manage to work down his Warriors and 2 Tomb Spyders. He had the Deceiver as well, who with the Wraiths & Lord made it across the table and killed my Platoon, HQ and eventually Ogryns. The game went on to turn 7 but at the beginning of turn 7 he realized I had killed enough of his army that he phased out, leaving me with the 11-3 victory. Still not dead, I swear! Well, the Paint or Die competition has come and gone and I failed miserably… I got Marneus Calgar (in terminator armour) and the forge world Venerable dreadnought painted… but that’s it. I started a Blood Angels in the midst of the competition and found it hard to keep painting basic, boring plain Marines when I could make wonderfully detailed models and paint each one like it was it’s own champion. Right now, I’ve painted 4 models in the month of June, all are highly detailed Blood Angel independent character models (Sanguinor, Librarian in terminator armour conversion, Chaplain in terminator armour and my own conversion of Brother Curbelo). 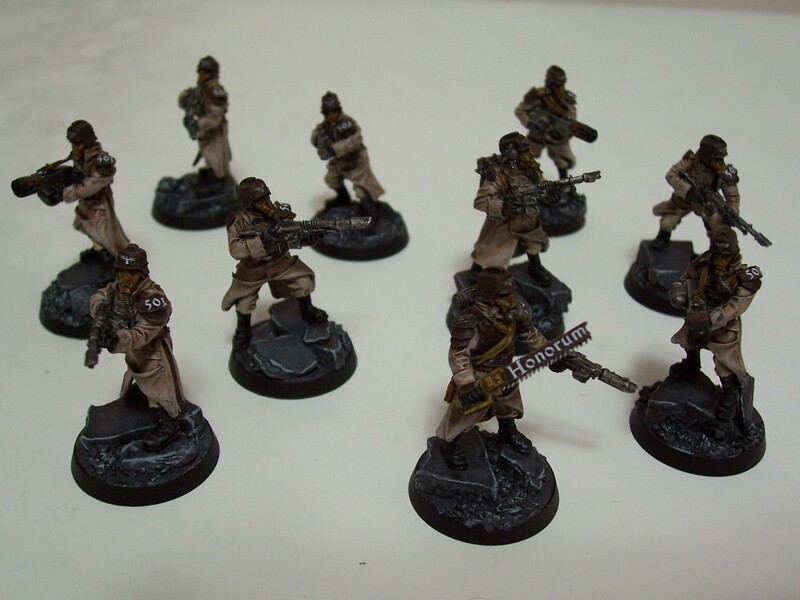 I will get back to the Death Korps, fear not. I am restructuring my army a bit, after playing with them for a few months it has given me a chance to learn what models I like and want. I was originally going to have just 3 of every vehicle except that over time I’ve learned I don’t want some of them (such as a Griffon). So I will keep building my models and paint them over time. Just a minor update, I have been painting my Ultramarines for a local Paint or Die competition we are having at A-Club. 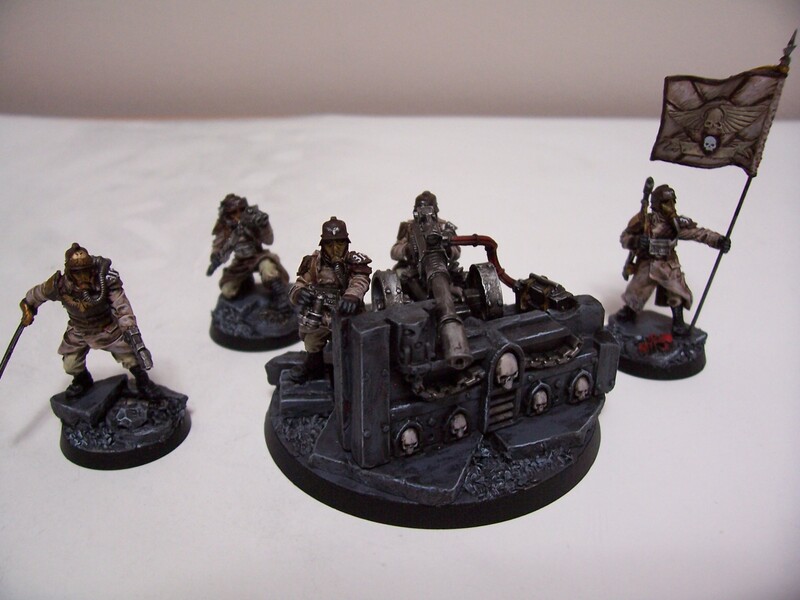 I am still assembling Death Korps models, in fact I am working a way to get the new Demolisher tanks to work with the Forge World version… stay tuned for that if it works! There are no tournaments or events happening anytime soon, but A-Club will be running the tournament at ConQuest GT BC Annihilation, for which I will be a part of. This is happening the day before my wife’s birthday, but she is willing to let me do it. 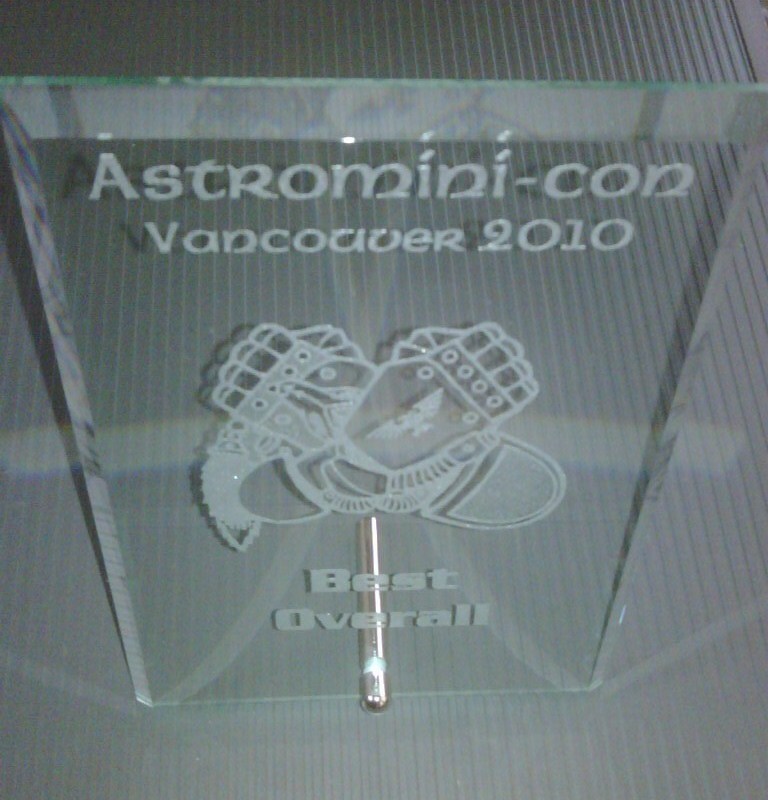 The next tournament I will be participating in is the Astronomi-con tournament in August, for which I won the free entry by winning the local Astromini-con. 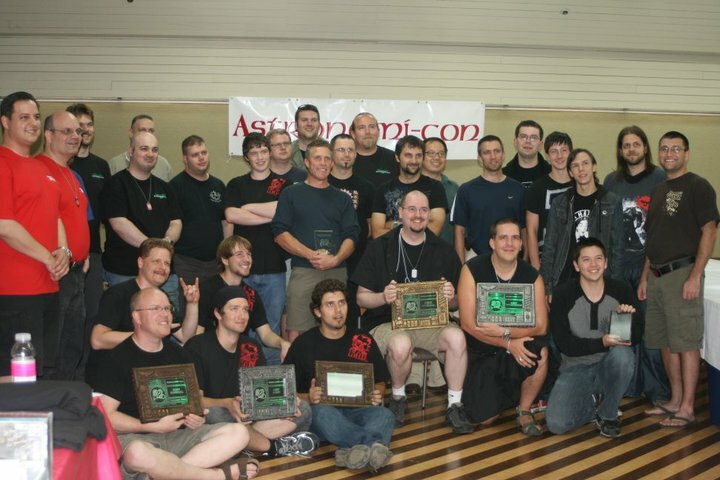 Every year a group of guys from Winnipeg, Manitoba, Canada (for those of you not from Canada whom are reading this) put on a great Warhammer 40,000 tournament in their home town. They started in 2001 and called it Astronomi-con. Soon after they were able to expand and take the event to Toronto, Ontario, Canada every year on top of their hometown event. Recently, in the last couple years, they have come to Vancouver, British Columbia, Canada (my hometown). I wasn’t able to make it last year to the event as it fell on my wife’s birthday (and no matter how much I tried, she wasn’t going to let me game a whole weekend on her birthday). It’s a 1500 point tournament with rules for composition, which I always try to follow as best I can. The tournament isn’t until August and to give us a taste of things to come some local Alumni hosted a mini version of the event called “Astromini-con”. In my list for Astromini-con I wanted to take the following: Command HQ Unit, 10-man Stormtrooper Unit, 5-man Ogryn Unit with a Chimera Transport, 25-man Platoon, 10-man Veteran Unit, Valkyrie, Vendetta, and 2 Leman Russes. Unfortunately, I didn’t have a couple of those units painted and it was a mad rush to finish them in time for the tournament (which I did manage to pull off by 8:10pm the night before)! Out of the whole army I needed to finish a Vendetta, the Veterans and the Stormtroopers. 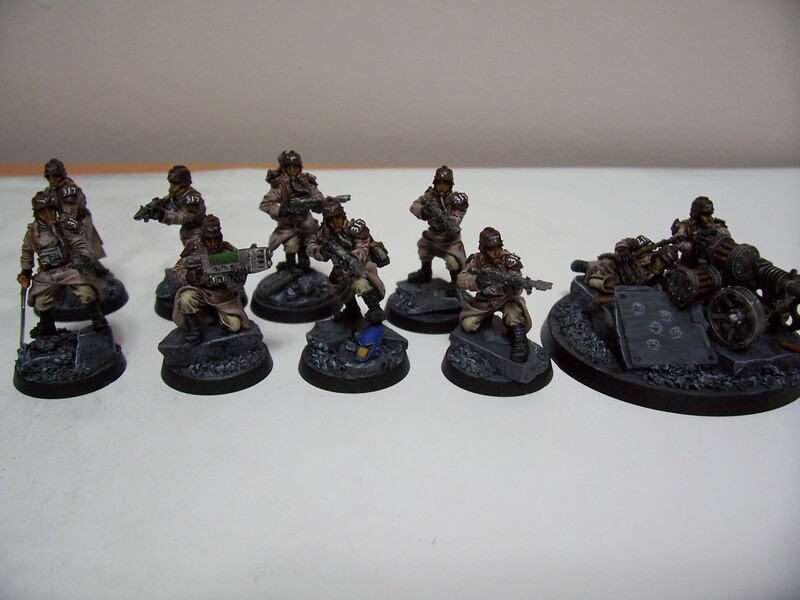 For my Vendetta, I decided a while back that it was more Imperial Navy than part of the Imperial Guard army itself, and therefore chose a non-camouflaged colour scheme that consisted of just a flat brown and a light grey belly. 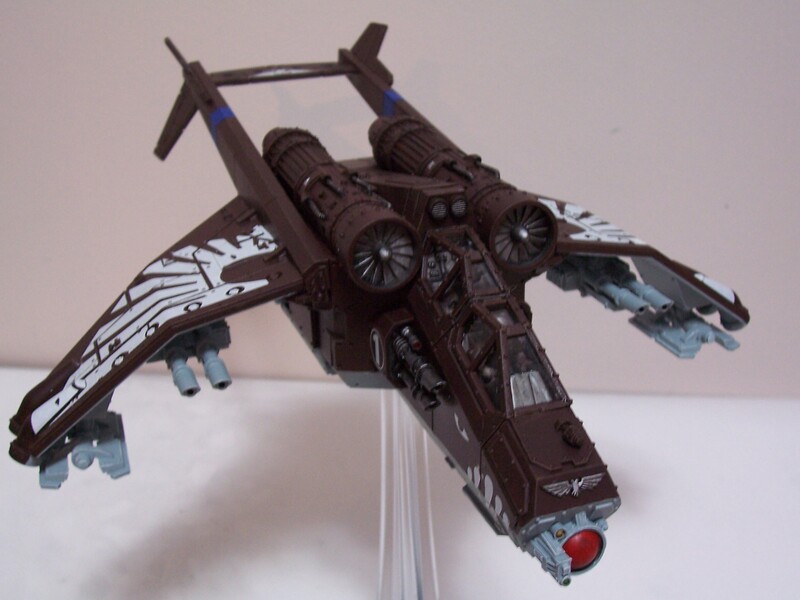 In the future, when I purchase Forge World fliers such as the Thunderbolt and/or Lightening, this will be the same colour scheme. The Veterans were just standard troop models I had left over and three meltagun models to bring it to nine, the final model was a bit more fancy and converted to be “Sergeant Bastonne” for use in other games complete with his Carapace Armour and Hellpistol. At last count, I owned seven 10-man Stormtrooper Units, but this one is the only one I modeled with flamers. It so happened that points were so thin for this army composition, that flamers was all I could afford. 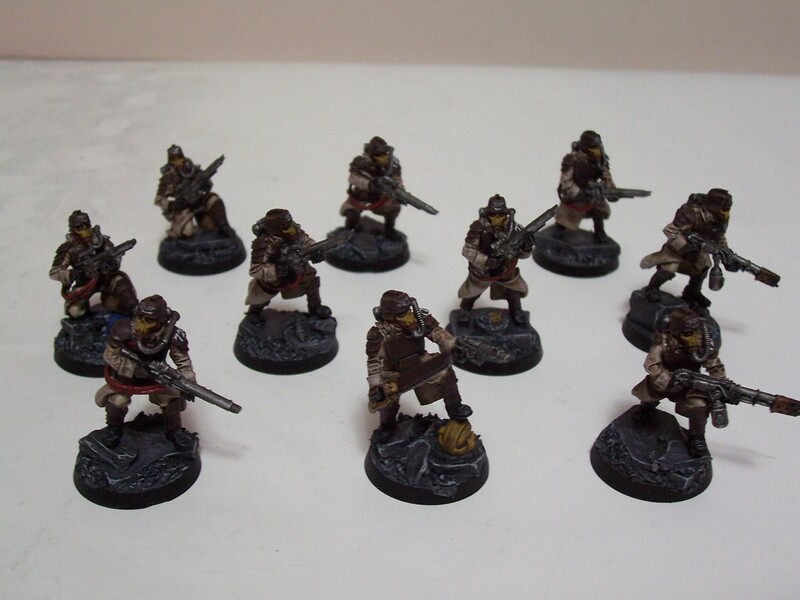 So this unit was chosen to be painted (the rest all of either 2 plasmaguns or 2 meltaguns). So this just past Saturday, the mall was open from 9am until 11pm for Christmas, so the staff at the Games Workshop decided to run a tournament for the day in which I participated. I didn’t actually know it was a tournament when I entered, I just wanted to play because the concept sounded fun. 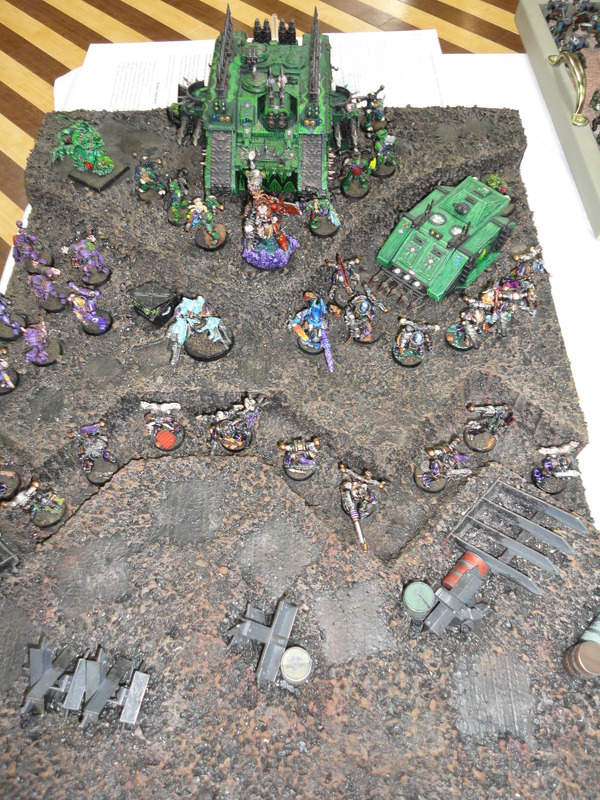 The idea was that everyone brought in 3,000 points and played a regular game of 40k for 2.5 hours. 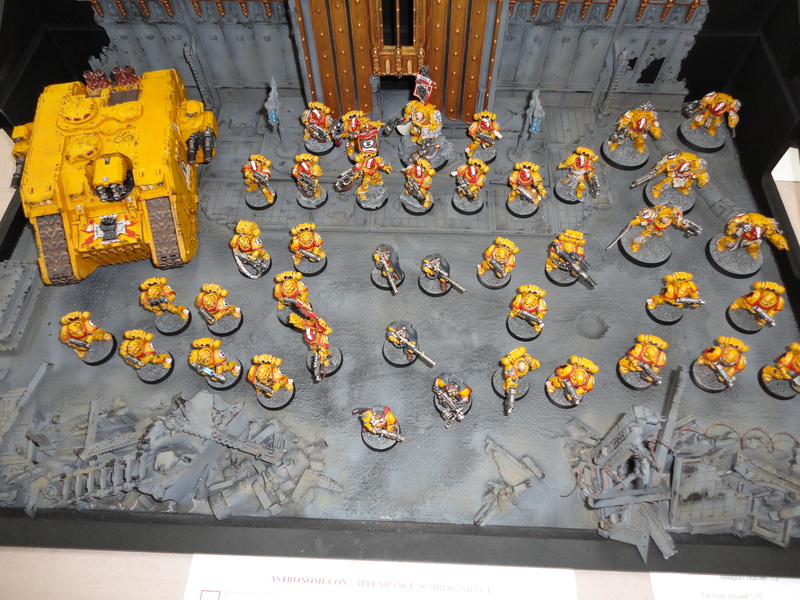 At the end of the game or time, whichever came first, all players would have to determine what was completely destroyed and what still had models left in a unit. Any vehicle or unit completely destroyed would be lost for the rest of the tournament. The depleted units would stay the same for the next round unless you used reinforcement points to top them back up. The reinforcement points were assigned based on the paint quality of the army. The more detailed, the higher the points up to a max of 10; starting out at having all models primed got you 2 points, then having them all base coated got you another 2, then detail, shading, highlights, squad markings, etc. With Christmas almost here and another Paint or Die coming to an end, I spent quite some time painting over the last two weeks. I also did some research on how to take a better picture, so far I think it has worked. I’ve taken some new pictures of the Ogryns since they’re such great models, you can view those new ones by clicking on them below in the Ogryn post. So, on to the painted items. 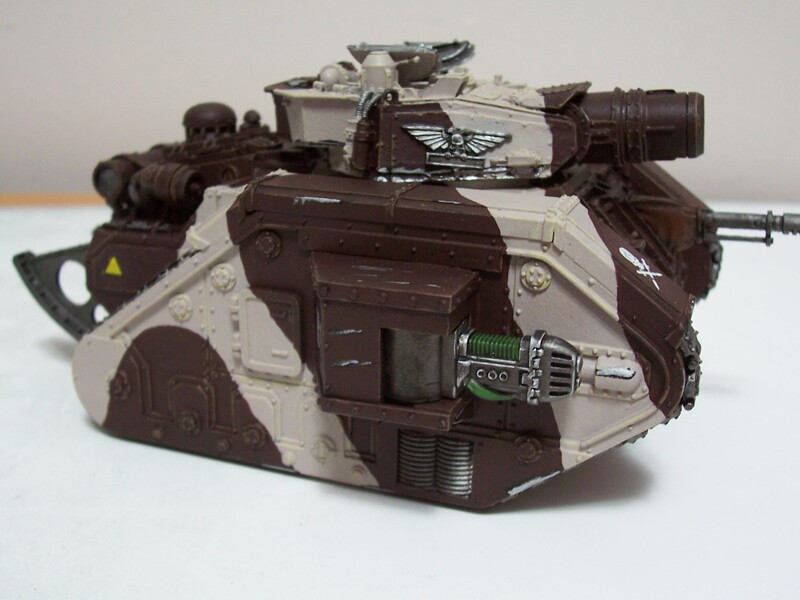 To start, I painted up a Leman Russ Demolisher. I cut down the heavy bolter sponsons and fit in some of the new plasma cannons from the new GW Demolisher kits, they turned out pretty good. With the new Lumbering Behemoth rule, this short range tank puts out a hell of a lot of destructive firepower. 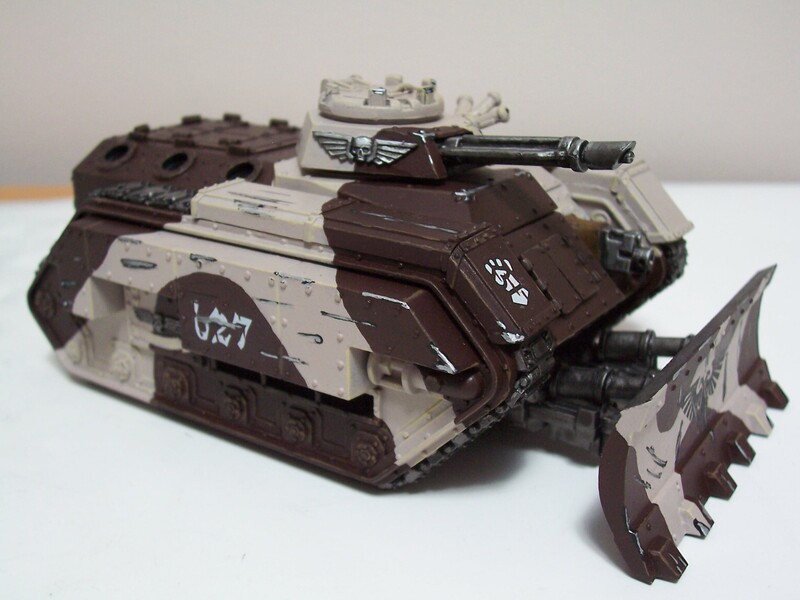 The next thing I painted up was a standard Leman Russ Battle Tank. Another full Forge World kit, complete with a different turret than the regular GW kit. Before the latest codex, I would have never put the sponsons on a Leman Russ, however, with the new rules I wouldn’t NOT have them! Lately, I have left my infantry models alone, simply because they’re so many and tedious to paint so many and a tank is just one large item. Well, I decided since I was going to be entering a tournament this just past weekend that I should paint some up quickly. This is a command squad with a lascannon on a custom built base. Continuing with my infantry push, I also painted up an infantry squad with an autocannon, again with another custom built base. These infantry are just extra models that won’t be on my display for the army so they’re all different base theme but I think the colours work together. In the new Codex, a couple new characters were written into the book that I decided I wanted to play around with but of course don’t want to use the regular model for them as they aren’t Death Korps; so I made my own versions. 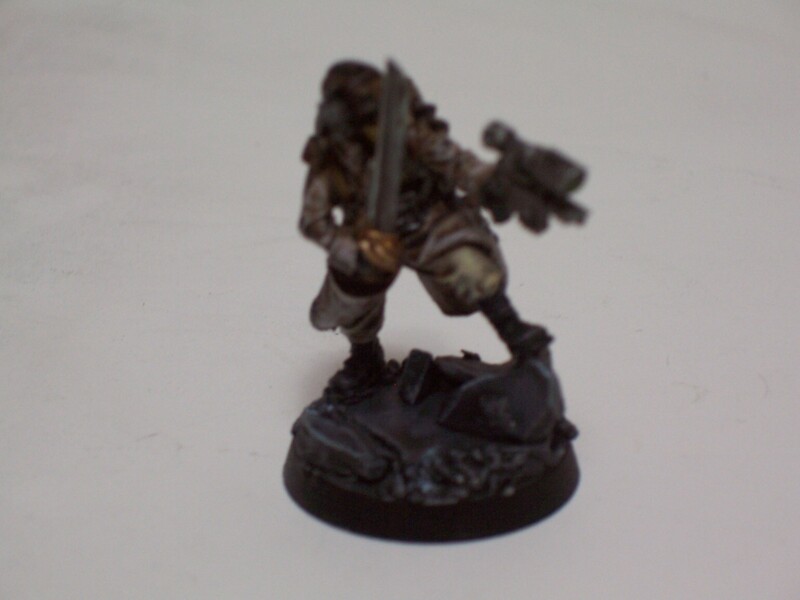 The first was Sly Marbo, or Rambo; not a very interesting conversion, just some kit bashing to come up with a model with all the right toys Sly has such as a sword, a sniper pistol and a demo charge. The next three models aren’t conversions, but what models I have chosen to represent them. The model on the left is a regimental advisor, the astropath, a model I traded with Doc which came from Inquisitor Rex’s retinue. 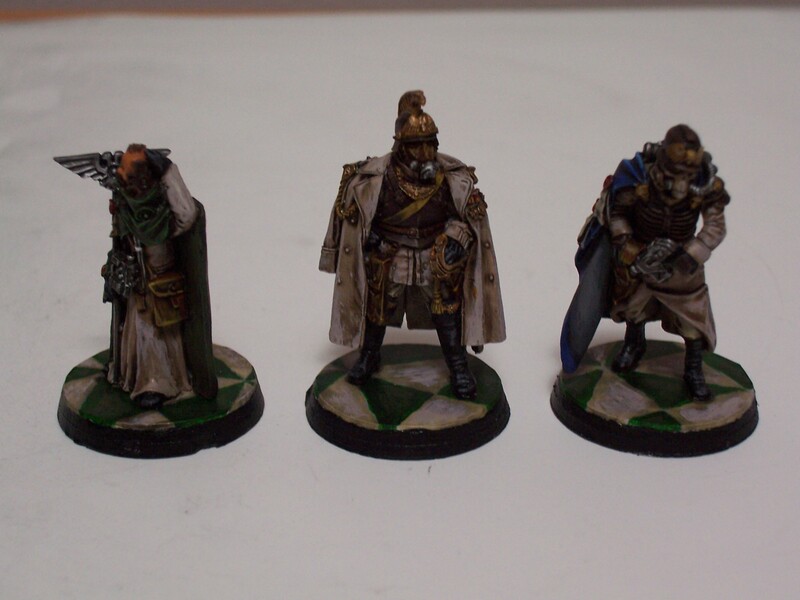 The model in the middle is Lord Castellan Creed, whom I’ve decided to call Lord Castellan Krieg, is just the force commander model. The last model, on the right, is another regimental advisor, the officer of the fleet. This model is actually the Quartermaster model intended to be used in a different fashion, however, I don’t plan on using the actual Death Korps list until it’s more up to date with the new codex. Last but not least on this large update is a Chimera. 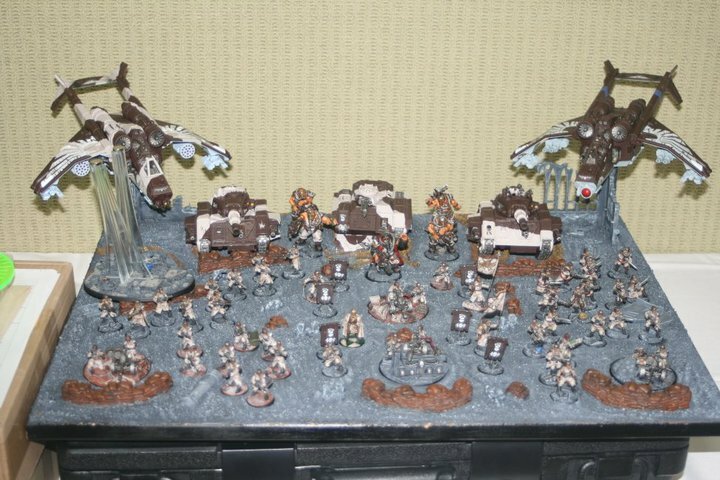 It can be used by any unit pretty much, so it’s not really dedicated to any unit officially in my army. A generic, small conversion on the lasgun ports in which I decided not to put the lasguns on the back area and closed up the ports. 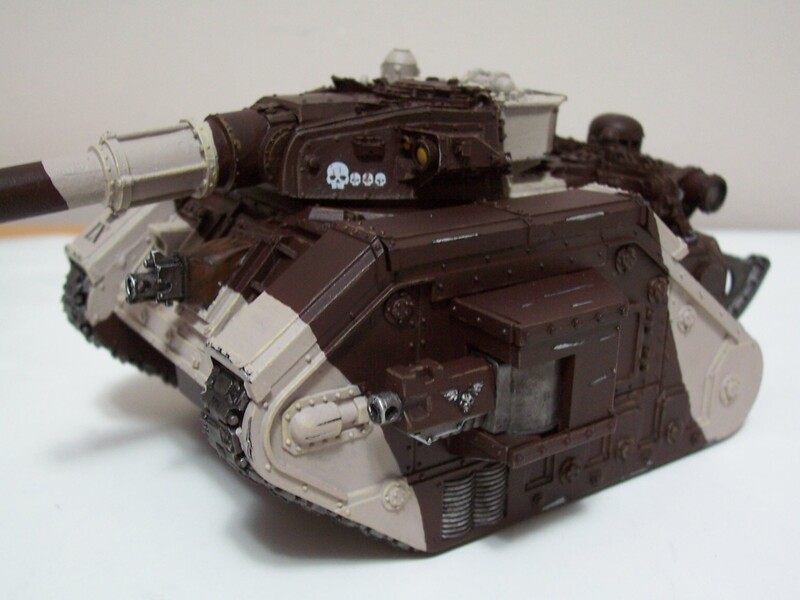 Currently the Ogryns are using it, but eventually they will have their own converted Chimera.